Couture Show and Conference, the elite jewellery trade fair. polished semi precious stones in rainbow colours, or hung with little softly undulating petal shaped motifs. Gurmit launching out on the catwalk, radiant and full of fire. In her third run, she took a hairbrush with her as an accessory, hooking it under her belt. Now I see that she already undulated like the jewellery she would create. Gurmit, born in Singapore in 1966, ran away from Singapore to escape a match wedding and ended up being the fashion icon in Paris, New York, Tokyo to the undisputable fashion icon for Karl Lagerfeld, Oscar de la Renta, Chistian Lacroix, Rei Lawakubo, YSL, Tom Ford, Alexander McQueen, Givenchy, Dior, Marc, Jean Paul Gaultier and lots more. Singapore , the unique Sikh fashion muse of Yves Saint Laurent for Italian Vogue by Steven Meisel. Photo by Jean - Babtiste Mondino for French Glamour. Late Monsieur Yves Saint Laurent my Fairy Godfather. One of today’s most renowned designers. When we met in summer of 1988 at Maison YSL in Paris, The first question he asked was of my origin. a most unusual sari that has never been created in the world..
his sari on me will look far better with only the flesh of my left breast exposed. It was sureal. collection with the theme of one breast exposed with fluid floral colours. We shared that electrical spark moment together when he was drawn into his magical world. I feel so fortunate to have been part of this astounding moment with Monsieur Saint Laurent's magic space. This was one of a life time experience with an exceptionally prodigious man who inspired me in so many ways..
"Gurmit is among those miraculous survivors who undertake life in pursuit of their dreams. single handedly, her ancestral culture with new dogmas, made from scratch from the novel truths confronting her. Possessed of a boundless gourmandise and curiosity, she has always known that to make her ideas live, she first have to live them. spend among the greatest creators of fashion, Yves Saint Laurent, Gevinchy. and Azzedine Alaïa. 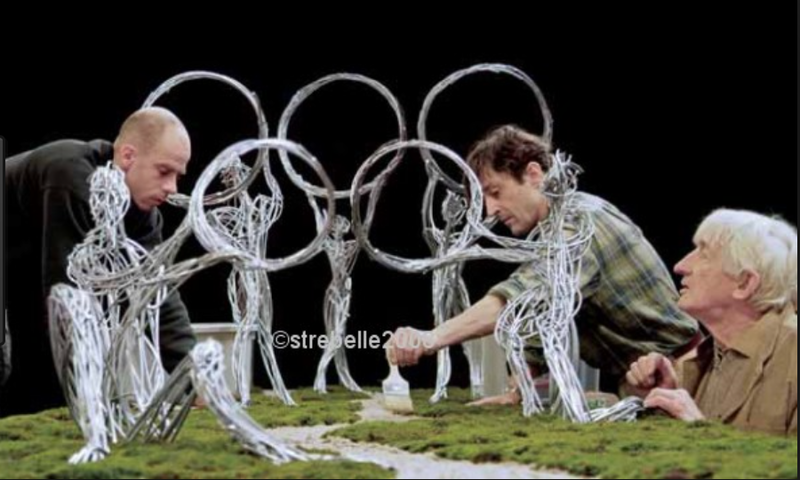 Artist Olivier Strebelle in the preparation in his team in his studio in Brussels for the model of 246.8-metre-tall (810 ft ) for the Olympic Park Observation in the Parks, gardens and landscapes in urban Beijing completed and opened in 2014. The Olympic Park Observation in Parks, gardens and landscapes in urban Beijing. where she had the great fortune of being the muse of fashion icons Yves Saint Laurent, and Azzedine Alaia. of her heritage with a modern Western sensibility, eroticism and wit. It is as multifaceted as her background. Creating unique pieces of jewellery and art for her friends and clients is for Gurmit a deeply personalised form of being. Gurmit , the only sikh fashion muse of Yves Saint Laurent for Italian Vogue by Steven Meisel.